An Anglo-Saxon settlement has been discovered on the site of the new All Saints' Academy in Cheltenham. 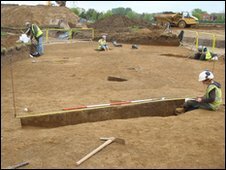 Two skeletons, pottery and a large timber hall, all thought to date back to between the 6th to 8th Century, have been uncovered. Steve Sheldon, of Cotswold Archaeology, said it was previously thought the area did not succumb to Saxon control during that period. He said the settlement was one of the best finds of his career. It is thought the hall, measuring 11m by 6m (36ft by 20ft), was used for communal events such as feasts. Mr Sheldon, who is directing the excavation, said he "didn't expect to find much" when the team started work. Cliff Bateman, project manager at Cotswold Archaeology, said: "It would now appear that there were more pockets of Anglo-Saxon control in the Severn Valley than we previously thought. "Anglo-Saxon burials have been found in Bishops Cleeve and Tewkesbury, but this discovery shows Saxon influence right on the very doorstep of Gloucester." The academy is being built on the site of the former Kingsmead School. Pupils from the former school, and from Christ College, will have a chance to look at the finds on 25 May before they are removed for dating and recording. The items will then be donated to Cheltenham Museum. Construction on the site is continuing and the academy is still on track to open in September 2011. Helena Arnold, director of children and young people's department at Gloucester Diocese, said: "This will provide an excellent learning opportunity for students even before the construction process is under way. "Whilst the academy looks to the future to provide first class facilities for the 21st Century, the archaeological find is an opportunity too for students to learn about the past and the culture from which we have developed."